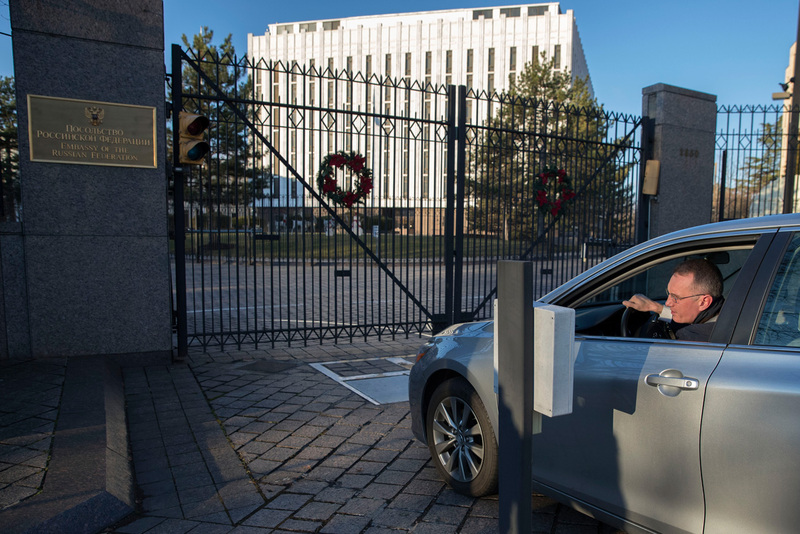 A man speaking Russian arrives at the Russian Embassy in Washington, DC, Dec. 30, 2016. There is no doubt that Barack Obama was consistent in making Russian diplomats officially “unwelcome” and sending them to pack for home when the U.S. expelled 35 of them on Dec. 29 in a move designed to punish Russia for its alleged attempts to influence the U.S. election. The unfriendly move, so tediously reminiscent of the Cold War mentality and practices, looks like part and parcel of a comprehensive last-minute revenge campaign aimed at complicating at least the first year of Donald Trump’s presidency. Similarly, the same intention was at the back of the mind of White House decision-makers when they eased restrictions on weapons supplies to Syrian rebels as part of the annual U.S. defense policy bill (signed by Obama on Dec. 23) a step that will invariably aggravate and prolong the civil war in this ravaged country. From the very beginning, right after Trump’s inauguration on Jan. 20, these roadblocks on two foreign policy tracks, defined as priorities by the president-elect, will have to be tackled by his team. Unlike the command “undo” in-built in computer software, sometimes there is no quick fix in such matters. The inertia of Obama’s petty malefaction might be felt long enough. Russia's Foreign Ministry according to a ‘standard procedure’ has mapped out an adequate response. It amounted to a list with the names of 31 personnel of the U.S. Embassy in Moscow and four diplomats from the Consulate General in St. Petersburg who could be easily declared persona non grata and sent back overseas (although they have already missed Christmas at home). As usual, some of them would have been engaged in activities incompatible with their diplomatic status, such as gathering intelligence, attempting to recruit agents and agents of influence among locals, and so on. So what? Isn’t this part of the game played on the grounds of espionage and diplomacy? On a sunny day, the host country only watches and ensures that no red lines are crossed. Any case involving an enforced farewell for diplomatic officials is an emergency. However, Russian President Vladimir Putin, as the ultimate foreign policy strategist, decided against retaliatory actions. Why? It has been duly noted in Moscow that Obama’s last days in office are being devoted to attempts, often quite successful, to embarrass and raise the pressure on Donald Trump while leaving him little room for manoeuver. This time Obama was clearly pinning his hopes on provoking Moscow into a symmetrical response, and expecting thetit-for-tat deportations to further sour bilateral relations. Putin, however, would not fall for the bait. “We reserve the right to retaliate, but we will not sink to the level of this irresponsible ‘kitchen’ diplomacy” (a reference to verbal abuse in communal use kitchens in overcrowded hostels), he said. In a gesture of goodwill, Putin offered an olive branch to the U.S. diplomatic corps that few could imagine. It appeared that he may have anticipated the move by Obama to up the ante in already tense bilateral relations on the eve of his scheduled departure. “We will not forbid families and children from spending the New Year’s holidays in the places they are used to. Moreover, I invite the children of all American diplomats with accreditation in Russia to the New Year and Christmas festivities in the Kremlin,” said Putin. Now it is clear that this rabble-rousing move by Obama did not produce a knee-jerk reaction in Moscow. Two main motives can be detected in the line of thinking by Kremlin strategists. Secondly, during his 12th annual marathon year-end press conference, attended by 1,400 journalists, Putin expressed dismay at what he saw as an unfounded smear campaign by the U.S. administration, who accused Russia of having “hacked” the elections, thus potentially influencing the result in favor of Trump and contributing to the defeat of Democratic candidate Hillary Clinton. “The Democrats are losing on every front and looking for people to blame everywhere… They need to learn to lose with dignity,” said Putin. And now he is showing class by behaving with dignity in the face of a move copy-pasted from the Cold War manuals. Judging by comments in the blogs and online forums in the aftermath of Putin’s conciliatory statement, a large segment of readers appreciate the Kremlin’s restraint. Probably, this is the easiest recipe how “to make friends and influence people” – simply display good temperament, long-term chess tactics, and, above all, the coolness of an international actor with dignity.